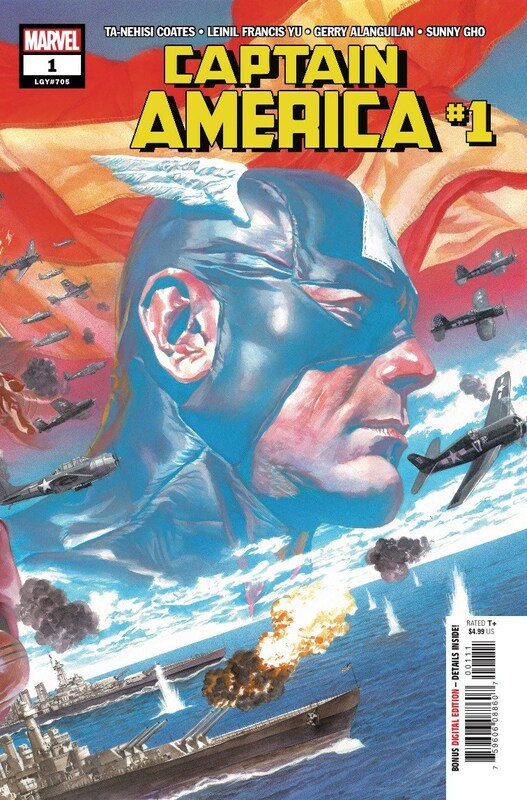 Captain America #1 Review – AiPT! The super-patriot returns with a new #1. Steve Rogers has been at the center of a lot of heated discussions in the last few years. The runs Nick Spencer wrote on both Captain America titles and Secret Empire brought mixed reactions to say the least. After a brief tenure by Mark Waid, Chris Samnee, and co., the character has changed hands once again with yet another issue #1. This time around, Ta-Nehisi Coates is the writer, Leinil Francis Yu is on art, Gerry Alanguilan inks, Sunny Gho colors, and VC’s Joe Caramagna letters. It’s one hell of a line-up, and they address the recent controversy. This issue sees Steve struggling with the American public’s decreased trust in him, and a new threat rears its head as well. There’s a lot riding on this relaunch, so the question is: is it good? Art-wise, this is a decent first showing from the new creative team. I’ve been a Leinel Francis Yu fan for over a decade now, and he does good work here. His renderings of the characters embody who they are in the popular conscience. Cap’s expressions, for instance, clearly convey his senses of duty, service, and determination. The flow of motion is also solid throughout most of the issue, particularly in the opening five pages set in Russia. Alanguilan’s inks complement Yu’s line-work very well, and Gho and Caramagna deliver serviceable work with their coloration and lettering. Unfortunately, while this issue looks good, it suffers from a lack of dynamic or engaging storytelling. This is especially troubling given that this is a #1. I didn’t necessarily need this issue to have more action than it does, but what violence is present feels almost sterile. Outside of the opening scene, a lot of the fight scenes lack composition choices and flow effective enough to keep me engaged. As far as the villains themselves go, this issue is a mixed bag. The reveal at the beginning that Selene is going to be a major player is cool and unexpected, but the foes Cap fights back home are boring. Shirtless dudes with American flags painted on their faces aren’t something I’ve never seen before, and their motivations aren’t probed into very deeply. The opening scene set in Russia is easily the highlight of the issue. The lack of depth is perhaps my biggest gripe about this issue. A lot of readers were expecting this issue to tackle the results of Secret Empire head on, and while the event gets addressed, no new insights are made. Cap has lost the trust of many Americans, but we already knew that, and Cap’s struggles aren’t made very thought-provoking. Sharon Carter and Winter Soldier both appear briefly, but they do little to stir up excitement in the slow, stale plot. Both Coates and Yu have a history of striking and memorable work, but neither of them lives up to their reputation here. It’s not that what they deliver is bad; the line-art and dialogue both show competence. There’s just not enough hard-hitting flair to make this issue stand out from the plethora of other Captain America #1s exist at this point. Overall, Captain America #1 is a disappointing read. There are several distinguished creators behind it, but by and large they deliver solid, not great, work. The artwork has more good points than bad, and the Selene reveal is cool, but that’s probably all I’ll remember within a week. Sometimes an issue isn’t offensively awful so much as it’s just boring, and that’s the case here. Readers who share my love of the creative team will probably want to stick around and see where this story goes, but those who pick the issue up on a whim are less likely to stick around. There’s potential here, but not enough to leave me hungry for more. Neither offensively bad nor good enough to generate excitement for the next installment, this issue starts the series off on a mediocre note.